Hey ya'll! With Valentines day quickly approaching, who feels the need to spoil themselves? I mean, single, dating or married...spoiling yourself is ALWAYS necessary am I right? Well let us do it for ya! You've come to the right place for an oh-so fab V-day themed giveaway. Enter: Birchbox. 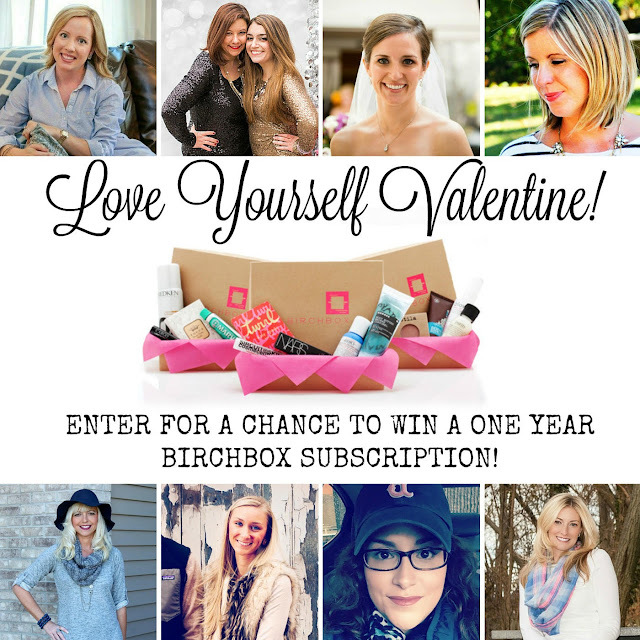 You know if you haven't already you are dying to get your hands on at least one of their boxes but now you can enter to win an entire year's worth. Yes, I said it, an entire years worth! Ya'll, holy moly enter already! Birchbox is the best way to try out and experience the best beauty products out there on your doorstep monthly - Love! Need I say more? The giveaway will run from 2/8 at 5am EST to 2/12 at 5am EST. A winner will be picked at random and once the entry is confirmed, they will be notified with their one year subscription. Be sure to check out and visit all of my lovely co-hosts and enter below! Good luck ya'll! Yay for this fun giveaway! I wish we could win it! I love this!! I have been wanting to try Birchbox for a while and I just haven't done it yet! would love to win, we don't have any plans (old married couple) but walking dead mid season premier is that night so you can bet we're watching that! How fun! What a great giveaway! Thank you! i am always down for spoiling myself! haha. Great giveaway! Low key Valentine's Day plans for my husband and I (movies), as we just went out & celebrated my birthday this past weekend! What a fun giveaway! I'm spending the day eating valentine's day cupcakes with my sissy! I don't have any Valentine's plans, sadly. :( But thank you for offering this giveaway!! We're going out to dinner Sunday night. I am hoping my daughters are able to come home from college this week end and we will go eat either Saturday night or Sunday lunch. If they aren't coming home I will stay in probably with my mom for a quiet Valentine's Day which is pleasant.